Dr Gary Acuff is Professor of Food Microbiology and Director of the Center for Food Safety at Texas A&M University, USA and Fellow of the International Association for Food Protection and the American Academy of Microbiology. Dr James Dickson is Professor in the Department of Animal Science at Iowa State University, USA and Fellow of the International Association for Food Protection and the American Academy of Microbiology. Beef production faces a range of challenges. There is an ongoing need to ensure safety in the face of threats from zoonoses and other contaminants, particularly in more intensive beef production systems and with more complex supply chains (allowing potentially broader transmission). At the same time, consumers have ever higher expectations of sensory and nutritional quality. Drawing on an international range of expertise, this book reviews research addressing safety challenges in beef production. The first part of the book addresses pathogenic risks on the farm, developments in detection techniques and safety management. The second part of the book reviews safety issues in the rest of the supply chain, from slaughterhouse operations to management of the cold chain and consumer handling of fresh beef. 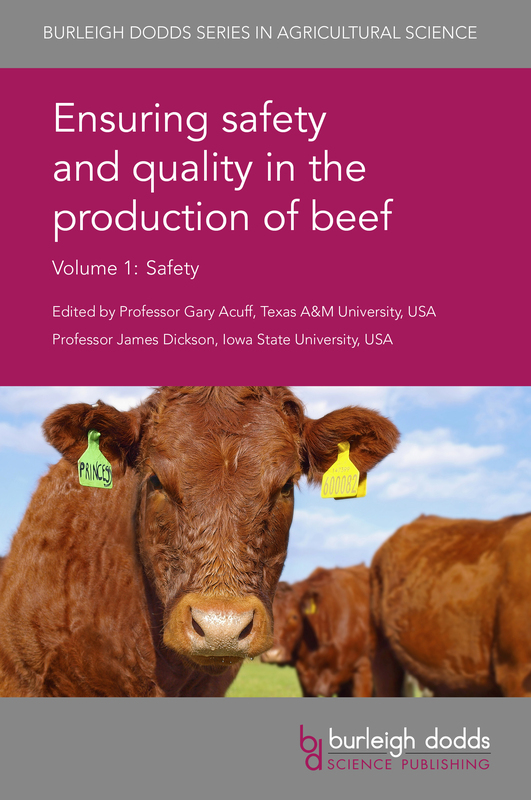 Ensuring safety and quality in the production of beef Volume 1: Safety will be a standard reference for animal and food scientists in universities, government and other research centres and companies involved in beef production. It is accompanied by Volume 2 which reviews quality issues in beef production. "This volume promises to be a valuable resource for the animal science research community." "Overall, Drs Acuff and Dickson have produced a truly international and model reference here; it reflects robust research-based knowledge and best practices across the entire supply chain of the beef industry. Authors reflect international expertise, and the topics are well-organized and germane to beef’s role in public health. Each author has compiled a very comprehensive discussion of their respective topics; but each chapter is ultimately comprehensible on food safety issues for even the less-knowledgeable reader. The text reflects the thoughts and knowledge of some of the best food safety minds in the business… all-in-all, a great read!"